Comments: The gray legs and thin, dark bill help distinguish the snowy plover from other plovers. It is easily observed along the Wildlife Drive at Quivira National Wildlife Refuge where it nests along the roadways or on nearby salt flats in late spring. It is pale in color and would go unnoticed if it didn’t dart about as it forages for invertebrates. Three eggs are typically laid in shallow scrapes marked with twigs or debris and most birds return to the site of the previous year’s nest. In western continental populations, the female abandons the young after about 6 days and the male provides care for 4-6 weeks. The female then attempts a second nest with a new mate. In Kansas, both adults tend the young and just one brood is attempted unless the nest is destroyed. 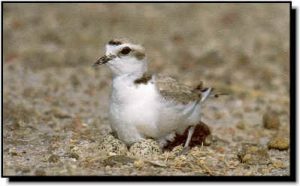 The major threats to the snowy plover are dewatering, loss of wetland habitats and human disturbance at nest sites.